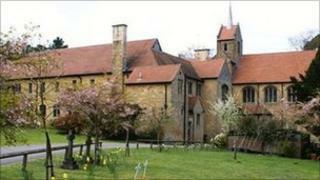 An order of monks which is leaving its Kent monastery because of rising costs has found a new home in Surrey. The Benedictine Monks of St Augustine's Abbey, Ramsgate, voted to leave their home of nearly 150 years because they could no longer afford to maintain it. Now they are set to move into the Franciscan Friary in Chilworth, Surrey. The Order of Friars Minor, which is vacating the 118-year-old friary, has welcomed the fact that it will continue as a home to a group dedicated to God. The 11 monks say they are being forced to leave St Augustine's, which was designed by Edward Pugin for around 40 people, because there are not enough of them left to bear the cost of its upkeep. The monks help fund monastery running costs by selling products such as honey, beeswax furniture polish, organic lip-balms and skin creams. They also have a small market garden. The monks voted to leave in October last year, and within four months had found an ideal replacement. The friars had had to make their own difficult decision to leave their Chilworth home for similar reasons, and thanks to the reach of the worldwide web, they were able to find suitable successors for their Victorian home. Father Michael Copps, Minister Provincial of the Friars Minor, said: "One of the most difficult things I have had to do as Provincial was to come to the decision that we could no longer sustain our house at Chilworth. "I had been thinking with horror that it might become a hotel or health spa, until I was shown the information on the internet that the Ramsgate Benedictines had decided that they had to leave Ramsgate and look for a smaller monastery. "Reading their 'wish list' for the place they were looking for, I saw that Chilworth ticked nearly all the boxes." Dom Paulinus Greenwood, Abbot of Ramsgate, said: "We have been extremely fortunate in finding a suitable new home within such a relatively short period of time, and will always be grateful to the Franciscans for alerting us to the availability of their Friary." The first Benedictine Monks arrived in Ramsgate from the Italian monastery of Subiaco in 1856. The friars will disperse into other friaries around the UK.